Comes with: Coravin Model Two, 2 Coravin Capsules, Coravin Wine Bottle Sleeve, Spray Mat, Needle Clearing Tool. Coravin's newest and best performing system lets you access, pour, and enjoy wine from a bottle – without pulling the cork. Taste, share, compare, and explore wines without committing to the whole bottle. The improved non-coring, faster pouring needle allows access to wine without cork damage. The new Coravin Model Two keeps your wine safe from oxidation, allowing you to enjoy your wine one relaxing glass at a time. Each Coravin Model Two Plus bundle includes two pressurized Coravin argon gas capsules, Coravin protective wine bottle sleeve, spray mat, needle cleaning tool and carry case. How many glasses can be poured per cartridge? BEST ANSWER: 15 glasses of wine (5 oz. pours). Does the needle need to be cleared after each use? BEST ANSWER: If you intend on using it on several different bottles, I would recommend that the needle be cleaned on each use. Do you leave the Coravin unit in the bottle until the bottle is finished? Wondering if it can be used on more than one bottle at a time. BEST ANSWER: No. Once you've inserted the Coravin, tipped the bottle, pushed the lever, and poured the wine that you want - you then remove the Coravin from the bottle. The Argon gas remains in the bottle preventing oxidation and you can set the bottle away. I've found that the Coravin can be used 3-4 times per bottle until the cork loses its integrity and starts to leak. No complaints - it works great. Hi Linda, oh no, you do not leave it in. That is the beauty of this device - I can sample three Cabs at one time without compromising the full bottles. As a single person, I LOVE IT! Each night I can drink a glass of a different wine without having to finish bottles before they go bad! Thank you Laura. I am the only one who drinks wine in my house so I always have unfinished bottles around. You do NOT leave the Coravin needle in the bottle. You insert it, pour the wine (single pour) and remove the needle. It can then be used on another bottle. The cork automatically seals the small hole where the needle was inserted. I use it to take a small amount out of a bottle to see how it is keeping. I have never left it in a bottle of if I plan on drinking it I go ahead and open it. No, you can take it out; the cork should reseal itself. It can be used with more than one bottle at a time. The Coravin is used only when pouring. The cork will reseal on its own. Does it work with plastic corks? BEST ANSWER: No, as the plastic won't reseal like cork will. Hi, this is not recommended as the plastic will not reseal like cork will. JYOTI K - will the plastic cork will reseal itself like natural cork? I've heard of bottles exploding, has this been a known issue, is the model 2 addressing this? BEST ANSWER: would say it might happen,that is why they give you a bag to put it in. I would say a bottle that does explode would be one with flaw in glass. I have seen it happen when bottles are filled on a bottling line, doesn't happen often, but it does.so far I really like the way the unit works. Coravin now includes a sleeve for the bottle. One would need to be careful, especially on older wines, that there are no cracks and that too much pressure is not used. I have used the model 2 maybe 3 or 4 times since I bought it and have not had an issue with any bottle exploding. You should use the sleeve when you use the Coravin. If I use the gas bottle for one pour how long will the gas bottle last without use or should I take the gas bottle out? BEST ANSWER: Jim B, After loading the Coravin argon capsule you will not need to remove it until it has been fully used up. While installed the capsule shouldn't leak any argon from the capsule at all, so unused it will last for quite a while. How long does a capsule last? What is replacement cost? 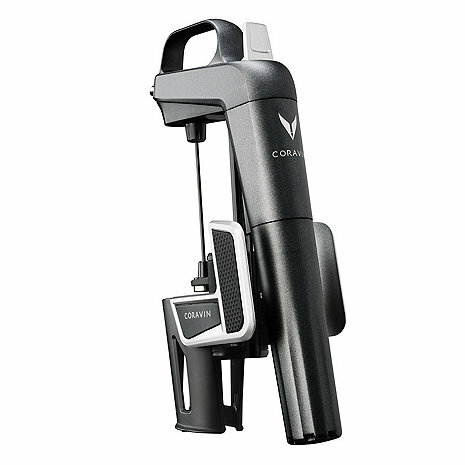 BEST ANSWER: The Coravin Model Two Wine System capsule should pour up to 15 glasses of wine. Refills are available. If it really is non-coring, why should we need to clean the needle after each use? BEST ANSWER: If the same wine is being poured, there is no need to clean, but if one is pouring different wines, it may be a good idea to clean so the wines are not mixing with each other. So far it has worked great tasting wines one and two weeks after initial puncture. Having a lot of fun trying small amounts of multiple wines at one time. A great way to have a glass of good wine and not ruin the rest of the bottle if you don't want to drink the whole thing in one day. So far so good altho' you run through cartridges pretty quickly. Once again, Darren Gold has been great in helping me with the purchase. I always - and only - buy my products from Darren. I have both the original and new model units. They did say that if I bought a "3rd" unit, they would send me a free needle and case. Having spent over $600 already, you think they would do the right thing here from a service-perspective. Purchased one for myself about a year or two ago. Just bought two recently as gifts. Recipients are wine drinkers but other members of their family are not ones who would enjoy finishing the bottle. Allows the recipient to enjoy without the guilt of wasting the entire bottle. Works as advertised. Very easy to use. Just wish it had a more substantial feel. Perfect gift for your self or others to enjoy a nice bottle over a week! Found if you wanted a glass in the bottom half of bottle I had to remove the Corvin unit and drink the balance of the wine. Sort of defeats the purpose of the Corvin concept. i haven't had this system long enough to give it a 5 star rating but so far it is working well. I need to have it preserve a bottle for a week or 2 to really test it. I really haven't had it long enough to know how well the wine in the bottle will hold up, time will tell. The system is pretty easy to use,seems to be built well enough.ask me again in 6 months or so and I will tell you how the bootlegs I have used it on are doing.